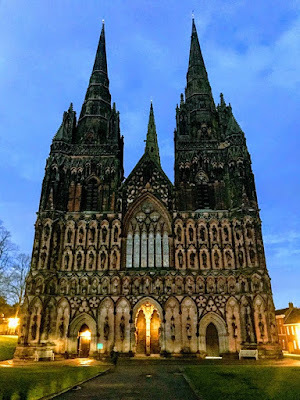 Before Lent began this year, I paid one of my regular visits to Lichfield and Lichfield Cathedral in Staffordshire, in the English Midlands. I am a life-long regular visitor to Lichfield, which played a formative role in shaping my Anglicanism and my spirituality. 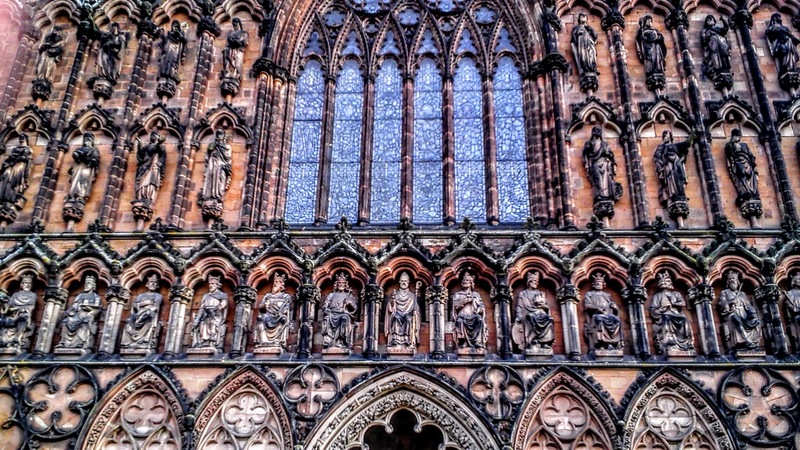 The cathedral dates back to Saint Chad, who had a large following, founded his monastery at Lichfield. There he was abbot and bishop and he was credited with converting the Kingdom of Mercia to Christianity. When he died in AD 672, he was proclaimed a saint, and people reported miracles at his tomb in Lichfield. 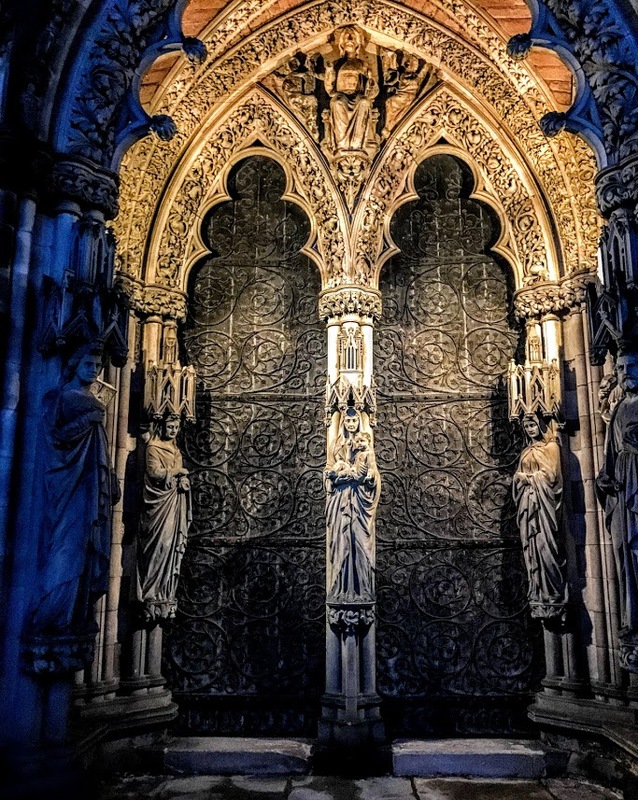 The ornate west front of Lichfield Cathedral includes a remarkable number of ornate carved figures of apostles, saints and English kings and queens. It is an almost over-powering statement in art and sculpture that the Communion of Saints is made up of all strands of humanity. This carved west front was the vision of the Gothic revival architect Sir George Gilbert Scott (1811-1878). He was influenced and inspired by AWN Pugin, and his pupils included George Edmund Street. Scott restored the west front in the 19th century, 100 years after most of the statues on the west front were removed and the stonework covered with Roman cement. Working with original materials where possible or creating fine new imitations and additions, Scott’s sculptors replaced almost all the 113 figures on the west front. The architectural historian, Sir Nikolaus Pevsner, dates them to 1876-1884, ‘replacing cement or stucco statues of 1820-1822.’ Most of the statues were produced locally from the Bridgeman workshop nearby in Quonian’s Lane. The only exceptions were a likeness of Queen Victoria on the main façade, by her sculptor daughter Princess Louise, and those around the central doorway by Mary Grant (1831-1908). A mediaeval carving of Christ in Glory remains in place in the canopy over the doorway. Visitors viewing the west front seem to pay less attention to the figures around the central doorway by Mary Grant. 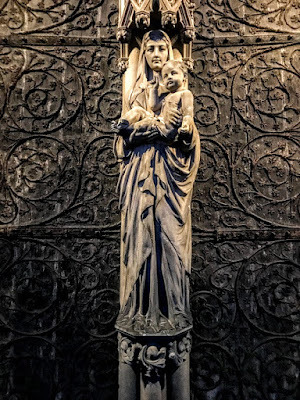 These include her sculpture of the Virgin Mary, who supports her lifelike infant gently. The Christ Child has one arm raised in blessing. Behind them stand the two Marys who visit the tomb on Easter morning: on the left is Saint Mary Magdalene, holding ointment; to the right the ‘other Mary’ (Matthew 28: 1) or Mary the Mother of James (Mark 16: 1, Luke 24: 10). In her composition of the figures at the West Door of Lichfield Cathedral, Mary Grant links the Virgin Mary and the Christ Child with the two women who visit the grave at Easter morning; the porch of the West Door becomes symbolic of both the cave of birth at Christmas and the grave of death at Easter; the Incarnation leads us on to the Resurrection, Christmas invites us to move towards Easter. Mary Grant was once described as ‘one of the busiest of lady-sculptors.’ She was born in 1831 in Kilgraston, Perthshire, into a distinguished family. Her grandfather was Thomas Bruce, the seventh Earl of Elgin, who pilfered the Parthenon Marbles from the Acropolis in Athens and sold them to the British Museum in London. Her aunt, Mary Anne Grant, and her uncle, Sir Francis Grant, were artists too. Sir Francis was a successful portrait painter and became President of the Royal Academy and a trustee of the National Portrait Gallery. 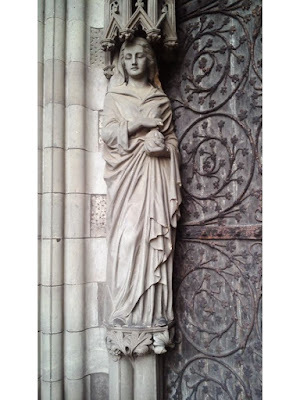 Sculpture was a profession that required a degree of physical strength; on the other hand, her aristocratic and artistic background probably were advantages for a woman seeking to work in what was virtually an all-male preserve in the Victorian era. Mary Grant studied in Florence, Rome and Paris before she set up a studio in London in the late 1860s. Her work includes a portrait of Queen Victoria for India and a bronze bust of the Irish politician Charles Stewart Parnell for the Royal Academy in London. Her other works include the screen of Winchester Cathedral and the marble reredos in Saint Mary’s Cathedral, Edinburgh. She never married and died in Chelsea on 20 February 1908. 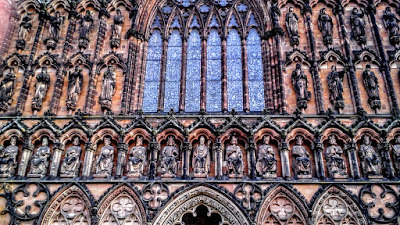 Lichfield and Lichfield Cathedral have been a place of pilgrimage and retreat for me since I was a teenager. As a 19-year-old, I found myself – by accident or coincidence – visiting the chapel of the Hospital of Saint John the Baptist without the Barrs. 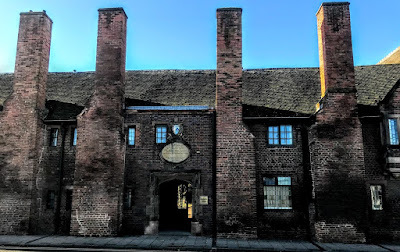 Saint John’s Hospital was established in 1135 and provided hospitality for mediaeval pilgrims who travelled from far and wide to Lichfield to visit the cathedral and the tomb of Saint Chad. 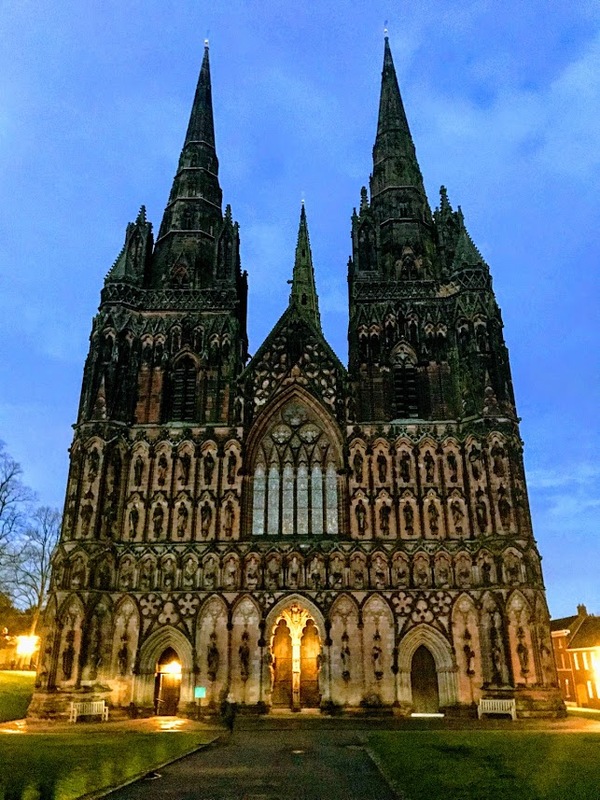 When the city gates of Lichfield were closed at 9 p.m. every night, pilgrims who arrived later had to stay at the Hospital of Saint John Baptist without the Barrs – the ‘barrs’ being the city gates. Saint John’s Hospital was established in 1135 by Bishop Roger de Clinton (1129-1148). It was built beside to the Culstrubbe Gate, one of the four gates erected on the perimeter of Lichfield, at what is now Saint John Street. Saint John’s provided overnight accommodation for pilgrims for several hundred years while it was a house of the Augustinian Friars. In many mediaeval towns in England, the friaries, convents and religious foundations often stood side-by-side, providing the surrounding communities with the equivalent of hospitals, hostels, and places of hospitality and welcome. In the 13th century, the Augustinian community at Saint John’s consisted of a prior, brothers and sisters, with a chapel and community buildings. Travellers and pilgrims ate and slept in a long mediaeval hall, with an undercroft below. For 300 years or more, Saint John’s provided hospitality for travellers and pilgrims, while local people used the chapel as a place of worship. These neighbours were served by a chaplain, and in turn they endowed the hospital and built a chantry chapel. These benefactors included William de Juvenis, still remembered each year with a red rose on the Feast of the Nativity of Saint John Baptist (24 June). By the mid-15th century, the ditch and ramparts around Lichfield had fallen into disuse and the gates remained open at night for late arriving pilgrims. Times were changing, and when William Smyth became Bishop of Lichfield in 1492, he put Saint John’s to new uses, re-founding the priory in 1495 as a hospital for aged men and as a free grammar school. New statutes provided for a Master who was a priest appointed by the Bishop of Lichfield. The hospital was to house ‘13 honest poor men upon whom the inconveniences of old age and poverty, without any fault of their own, had fallen.’ They were to receive seven pence a week, they were to be honest and devout, and they were to attend prayers every day. The canons’ and pilgrims’ hall was enlarged to provide a house for the master and a new wing was added to the old building. This new ‘almshouse,’ with its row of eight chimneys, provided each almsman or resident with his own room and fireplace. Many of these religious houses came to an end in the 16th century, with the Reformation and the Dissolution of the monastic houses. The estates often enriched political supporters of the Tudor dynasty, but their loss also deprived many people of access to health care and education. But the changes introduced by Bishop Smyth a generation earlier ensured the survival of Saint John’s as a hospital or almshouse and as a school. The grammar school was separated from the hospital in 1692, but the school continued to use the chapel, and the schoolboys included literary figures such as Joseph Addison, Elias Ashmole, Samuel Johnson and David Garrick. Edward Maynard rebuilt the Master’s Hall once again in 1720 to keep up with modern Georgian architectural tastes, and the stone tablet above the doorway dates from this period. By the early 19th century, Saint John’s must have had the character and the problems described by Anthony Trollope in his novels, including The Warden and Barchester Towers. In 1829, a north aisle was added to the chapel and a new three-bay arcade was built. In another major restoration in 1870-1871, the Master, Philip Hayman Dod (1810-1883), repaired and renovated the chapel, raising the walls of the nave, building a new roof, and adding buttresses outside and a stone bell-cote and bell. In 1929, the almsmen’s rooms at Saint John’s were rearranged to overlook the court or quadrangle, giving them more light and modern heating and sanitation. The Master’s House was renovated in 1958, new flats were added in the mid-1960s, and the inner quadrangle was completed with a new building. In the 1960s too, for the first time, married couples were allowed to take up residence in the hospital. After Lichfield Theological College in the Cathedral Close closed in 1976, new accommodation was provided in what became the Hospital of Saint John’s within the Close. At the beginning of 21st century, the 1495 east wing of Saint John’s was renovated, enlarged and updated. Recent work on building 18 new apartments was delayed briefly when the skeletal remains of 50 mediaeval pilgrims – adults and children– were found in shallow graves. 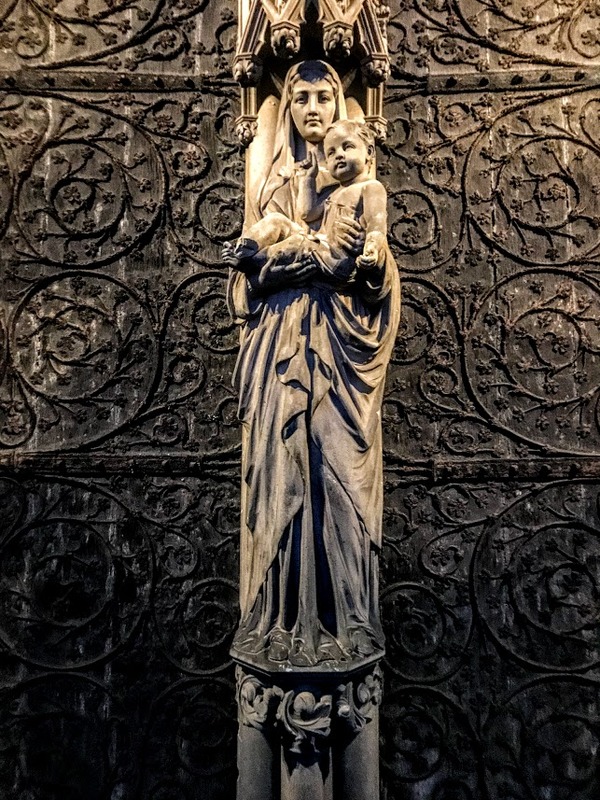 Since the Tractarian Revival, the chapel of Saint John’s has stood in the Catholic tradition of Anglicanism, and it has shaped my own Anglicanism and spirituality. When I was a 19-year-old, attracted by the distinctive row of eight Tudor chimneys fronting Saint John Street, I walked into the hospital one summer afternoon in 1971. Accidentally, I stepped into the chapel and soon felt filled with the light and the love of God. 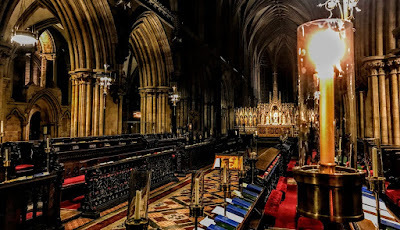 At the time, I had no idea of how to respond, and so found myself sitting in the choir stalls at Choral Evensong in Lichfield Cathedral. Later, a residentiary canon asked whether a young man like me was considering coming to church because I was thinking of ordination. That afternoon is a sensation that remains a living, daily experience. I often refer to it as my ‘self-defining existential moment.’ On my regular return visits to Lichfield, I continue to visit both the chapel and the cathedral. The chapel continues to provide daily and weekly services, and regularly draws a congregation of residents and visitors, and the grounds offer an oasis of peace and calm in the heart of the cathedral city. John Piper’s magnificent stained glass depicting ‘Christ in Majesty,’ was placed in the east window of the chapel in 1984. It too provides an appropriate focus for Lent and Easter. Christ has his arms outstretched, as if he is the Crucified Christ, with the cross of the Diocese of Lichfield behind his shoulder. But this is the Risen Christ, his eyes are opened, he is surrounded by the symbols of the four evangelists, and the two angels with trumpets are proclaiming the joy and triumph of the Resurrection. When morning light streams this window, it reminds us that not only Lent but our whole life is lived in the joyful hope and expectation of the Resurrection. This four-page feature is published in Koinonia, Vol 11, No 36, Trinity I (Kansas City, Missouri, July 2018), pp 20-23.